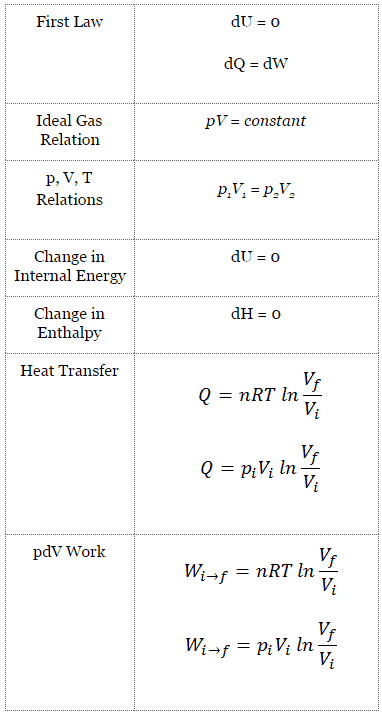 An isothermal process is a thermodynamic process, in which the temperature of the system remains constant (T = const). The heat transfer into or out of the system typically must happen at such a slow rate in order to continually adjust to the temperature of the reservoir through heat exchange. In each of these states the thermal equilibrium is maintained. For an ideal gas and a polytropic process, the case n = 1 corresponds to an isothermal (constant-temperature) process. 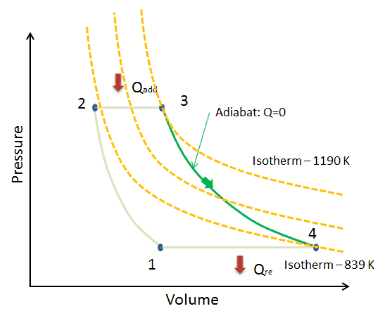 In contrast to adiabatic process , in which n = κ and a system exchanges no heat with its surroundings (Q = 0; ∆T≠0), in an isothermal process there is no change in the internal energy (due to ∆T=0) and therefore ΔU = 0 (for ideal gases) and Q ≠ 0. An adiabatic process is not necessarily an isothermal process, nor is an isothermal process necessarily adiabatic. In engineering, phase changes, such as evaporation or melting, are isothermal processes when, as is usually the case, they occur at constant pressure and temperature. In this equation dW is equal to dW = pdV and is known as the boundary work. Boyle-Mariotte Law. For a fixed mass of gas at constant temperature, the volume is inversely proportional to the pressure. Source: grc.nasa.gov NASA copyright policy states that “NASA material is not protected by copyright unless noted”. In this equation the symbol R is a constant called the universal gas constant that has the same value for all gases—namely, R = 8.31 J/mol K.
On a p-V diagram, the process occurs along a line (called an isotherm) that has the equation p = constant / V.
For a fixed mass of gas at constant temperature, the volume is inversely proportional to the pressure. 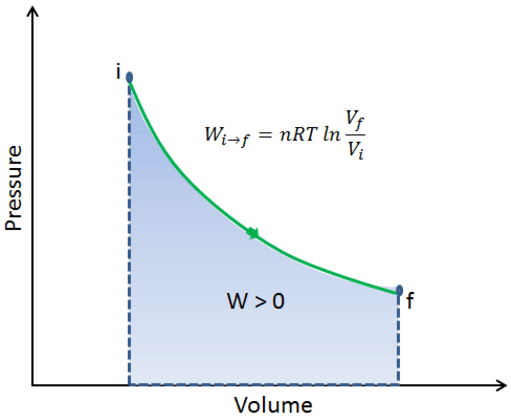 That means that, for example, if you increase the volume 10 times, the pressure will decrease 10 times. 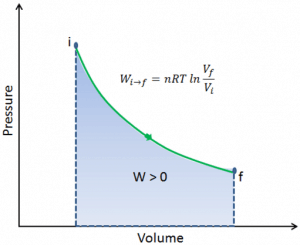 If you halve the volume, you will double the pressure. Yes, it seems to be identical as isothermal process of ideal gas. In fact, during their experiments the temperature remain constant as was assumed by Mariotte. These results are fully consistent with ideal gas law, which determinates, that the constant is equal to nRT. Assume an isothermal expansion of helium (i → f) in a frictionless piston (closed system). The gas expansion is propelled by absorption of heat energy Qadd. The gas expands from initial volume of 0.001 m3 and simultaneously the external load of the piston slowly and continuously decreases from 1 MPa to 0.5 MPa. Since helium behaves almost as an ideal gas, use the ideal gas law to calculate final volume of the chamber and then calculate the work done by the system, when the temperature of the gas is equal to 400 K.
By convention, a positive value for work indicates that work is done by the system on its surroundings. A negative value indicates that work is done on the system by its surroundings. The pΔV work is equal to the area under the process curve plotted on the pressure-volume diagram. A free expansion can not be plotted on a P-V diagram, because the process is rapid, not quasistatic. The intermediate states are not equilibrium states, and hence the pressure is not clearly defined. Fear of Radiation - Is it Rational?